In another fruitful collaboration between the University’s Centre for Jewish Studies and the John Rylands Research Institute, Dr Simon Mayers has been working for two months on the Methodist Collections at the John Rylands Library. The subject of the project has been Adam Clarke’s discourse about Jews and Judaism. 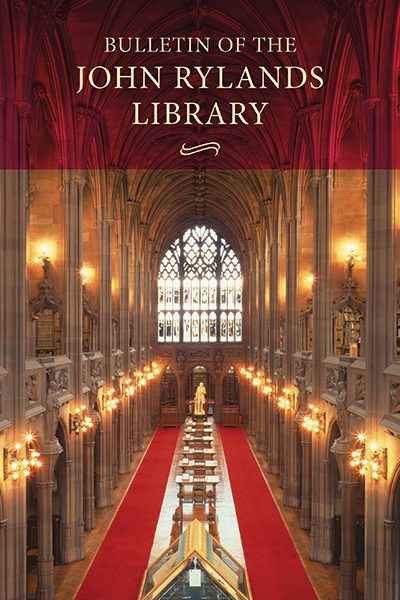 The study was conducted with the help of the rare books librarian and curator, Dr Peter Nockles, and was funded by a John Rylands Research Institute Seed Corn Fellowship. “This is the first of what is hoped will be a series of Jewish Studies related research proposals using the unique Methodist Collections,” said Daniel Langton, Professor of the History of Jewish-Christian Relations and co-director of the CJS. My paper for the forthcoming British Association for Jewish Studies (BAJS) conference (July 2015) will present some of the results of a project examining how Jews and Judaism were represented in the published works and unpublished manuscripts of Adam Clarke (1762-1832). Clarke was a prominent Methodist theologian, preacher and biblical scholar, best known for his eight volume commentary on the Old and New Testaments. Whilst the research is still ongoing, the material examined so far would seem to reveal that traditional theological stereotypes were a pervasive feature in Adam Clarke’s discourse about both biblical and modern Jews. In his commentaries and sermons, he would often take a passage from the New Testament about “the Pharisees,” “the Sadducees,” “the Herodians,” or the Jewish multitude, and not only expand upon it, but also magnify any polemical antipathy that he found severalfold. For example, according to Clarke, the Jews of antiquity regarded the command to love thy neighbour as applying only to “those of the Jewish race, and all others were considered by them as natural enemies.” The Pharisees in particular were portrayed as not merely hypocritical, wicked, envious, unspiritual, blind and hard-hearted, but also “radically and totally evil”. Clarke also caricatured Jews of subsequent generations, such as the medieval Jewish philosopher Moses Maimonides, and made numerous references to the Jews of “the present day” (i.e. the early nineteenth century), suggesting that they had changed little from the Jews of antiquity. He argued that it was by divine providence that the Jews had been preserved as a distinct people, downtrodden, ruined and dispersed among the nations, providing unimpeachable “evidence” and living “monuments” to the truth of Christianity. This project is supported by a Seed Corn Fellowship from the John Rylands Research Institute, and is envisioned as the first of a series of projects by the Centre for Jewish Studies at the University of Manchester which will explore the unique Methodist Collections at the John Rylands library (widely recognised as one of the largest and finest collections of its type in the world).